For those of us who dealt with or deal with a local butcher we know what a butcher block is - Figure 1. 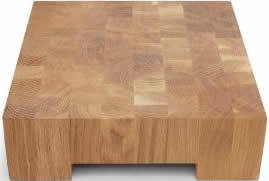 For those of us who want a stable chopping and cutting surface in our kitchens we want a butcher block chopping board. A butcher block is a type of wood chopping/cutting board. 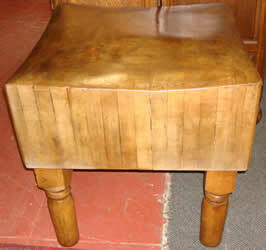 It is usually made up of solid pieces of hardwood, maple or oak, but can also be made of bamboo. Although most butcher block cutting boards are just that, boards that sit on a countertop, as shown in Figure 2, and are used for chopping and cutting meats and vegetables, butcher block is also available as a countertop material, as shown in Figure 3, or as a free standing chopping block, as shown in Figure 1. Home butcher blocks are usually three to four inches thick, while butcher block countertop material is usually two inches thick. Commercial butcher blocks can be 16 to 20 inches thick. 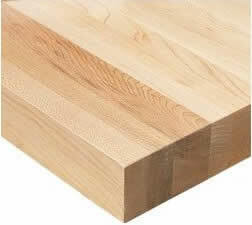 Note: Bamboo has recently become a very popular material for making butcher block cutting boards and countertops. Additional information on bamboo countertops. Butcher blocks or wood chopping blocks and boards are not inexpensive and to keep them in sound and in good condition they require some tender loving care. General cleaning of your butcher block should be done after each use using a soapy, damp cloth. Remove any soap residue using a clean, damp cloth. Note: Never use a scouring cleanser on any type of butcher block or wood chopping block or board. The longer the stain is left the harder it is to remove. Hence stains should be removed as soon as they occur. For light stains sprinkle some coarse salt over the area and rub the salt into the stain using half a lemon. For heavy stains can be removed using a solution of hydrogen peroxide mixed with water. Use 1 ounce of hydrogen peroxide mixed with a quart of warm water. For supper tough stains use chlorine bleach mixed with water. Use 1 cup of bleach mixed with 1 cup of warm water. Allow the solution to sit on the stain for 15 to 20 minutes. With all of the aforementioned stain removal methods rinse the solution off the butcher block with clean fresh water and towel dry. Your butcher block chopping board will have cuts and scratches in the surface (unless you don’t use it!). Cuts and scratches can be sanded out of the surface of the butcher block using 100 grit sandpaper , either manually or using an orbiting sander. Always apply a food grade mineral oil to the surface after sanding – see item 4. You can protect the surface of the butcher block chopping board by applying a coating of food grade mineral oil every month. Make sure the butcher block is dry. Using a soft clean cloth wipe the mineral oil over the butcher block. Wait 10 to 15 minutes and then wipe off any mineral oil that did not penetrate into the surface of the butcher block. The use of mineral oil also helps prevent the wood from shrinking and cracking, a common occurrence with butcher block chopping boards. Note: Do not use vegetable or fruit oils (olive oil) as these types of oils can become rancid. Food grade mineral oil will not go rancid and it has no effect of polyurethane or varnish finishes.